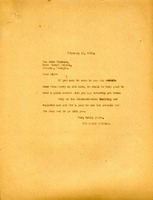 A letter informing Martha he couldn't get to Berry on Saturday, but would arrive sometime Sunday with his wife. 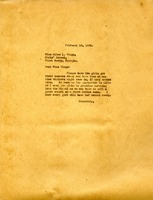 A letter inquiring if Mr. Cameron could come to Commencement on the 22nd of May after Mr. and Mrs. Ford had told Martha that he might be able to. 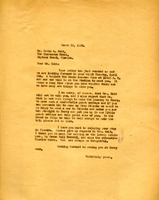 A letter expressing how nice of a time Mrs. Dull had during her visit to the Berry Schools and an offer to return and teach some of the students to make various types of food. 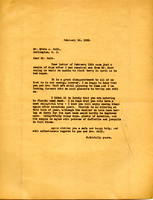 A letter discussing travel arrangements for Mr. Holt's visit to Berry on April 5th. 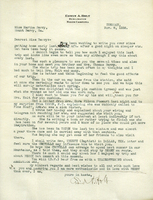 A letter to Mr. Erwin Holt expressing Martha Berry's excitement that him and his wife will still be visiting in April but also disappointment that Mr. Mack won't be able to make it as well. 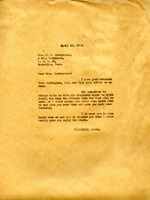 A letter to Martha Berry expressing how much he enjoyed his last visit to Berry and how he's recommending other people to visit as well. 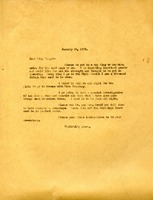 Letter to John Hickman from The Berry Schools informing him that he is free to visit any Saturday that he can, even when Miss Berry won't be there and he is given instruction on what to do when he arrives. 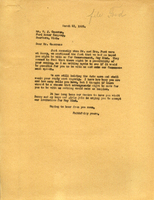 Berry asks Wingo to instruct the girls to have their bonnets ready and to expect to practice marching into the Chapel as soon as the quarantine is lifted. 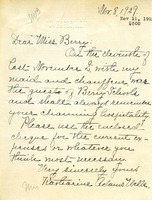 Berry instructs Wingo to devote all energy into getting things at the Girls School, particularly Clara Hall, clean and "in perfect order" in advance of important visitors and a special investigation of the dining room and kitchen. 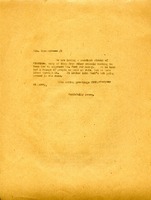 Winchester writes to arrange a visit to Berry at the same time the Pilgrims are there. 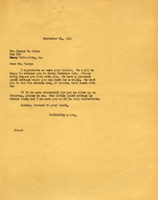 Berry suggests that Winchester not come to Berry at the same time as the New York group, as she will not be able to spend enough time with her. 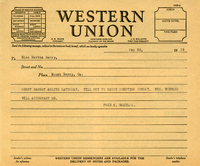 Wells, her maid, and chauffeur send thanks for Berry's hospitality during a recent visit. She encloses a $500 gift to be used as Berry sees fit.